With Archive Pro, you can easily and quickly archive your Maximo data and store it safely in an archive database. The Archive Pro wizard guides you through the process and lets you tailor it to meet your system performance goals, data retention policies or regulatory requirements. 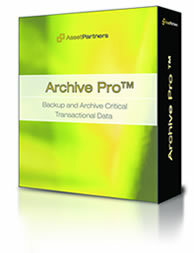 Designed specifically for Maximo, Archive Pro provides benefits and features that no other archiving tool can offer. The data in the Archive database can be viewed using the Maximo application if desired, making it easy for users to lookup archived data. Wizard-style interface guides you through the Archive process. 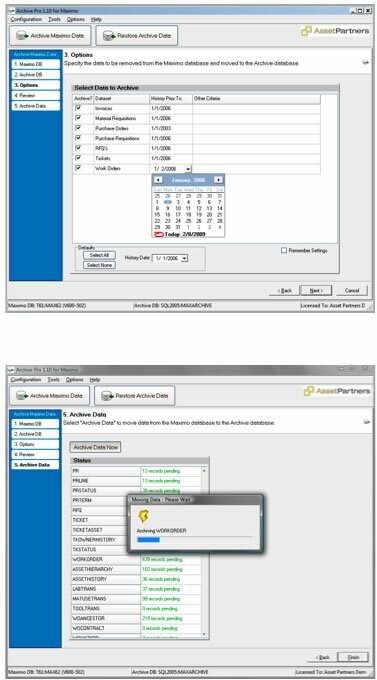 Select the desired Maximo data and date ranges to be archived. Very fast and efficient performance.